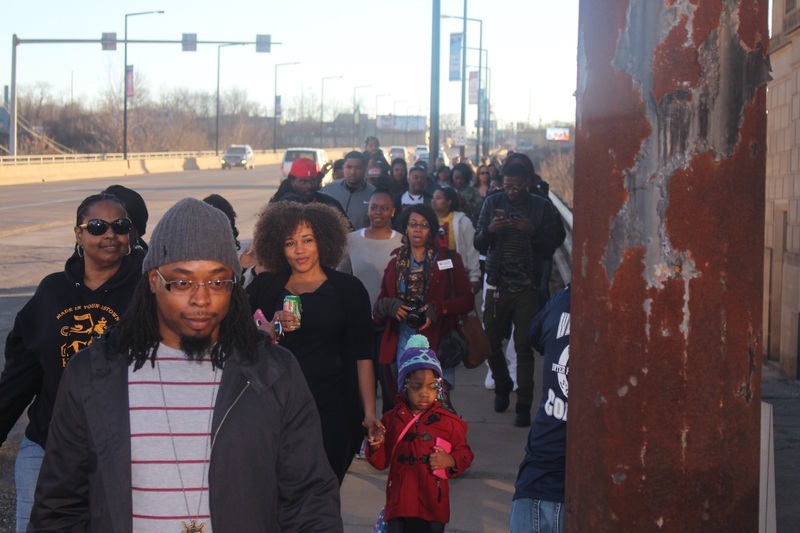 The city’s very first peace walk, bonfire and cypher was held under the Market Street bridge downtown on Sunday. Groups of people met at four different locations, each representing one of the four sides of town. They then marched together in unison, meeting at the corner of Front Street and Market Street. The peace walk was organized after several citizens from the city decided it was time to put their differences aside and come together as a community. Youngstown’s The Colony, a non-profit, played a large role in organizing the event. Keland Logan was one of the event organizers. He said there are plans to make the bonfire a monthly event so they can continue to make an impact on the city. “Despite our differences and despite whatever it is we may disagree on, we decide to come together for the greater good of the whole,” Logan said. According to Logan, the idea for the peace walk came after a meeting between Youngstown Mayor John McNally, William “Guy” Burney, executive director of the Community Initiative to Reduce Violence for the City of Youngstown, and several residents that wanted to help put an end to a local feud. Charles “Chip Banks” Colvin, a local DJ and YSU student, provided music for the event. Julius T. Oliver, city councilman, brought the welcome message to those in attendance. After the welcome message, pastor Jeff Stanford lead a prayer, asking for everyone to grab ahold of the person next to them to show a sense of unity and love. McNally spoke to the crowd stating that in order to change the city it starts with these kinds of meetings. During the next part of the event, local rappers were able to take ahold of the microphone and participate in a cypher, an activity where a group of rappers gather in a circle and express themselves lyrically. Some of the verses from the local rappers included feelings toward the police, the violence in the city and the need for change. Guests in attendance were also welcomed and encouraged to take the mic and express themselves through words, songs or raps. Several people took the chance to speak to crowd, calling for an end to violence and a challenge for change. One of the speakers was Derrick McDowell, founder of the Youngstown Flea.